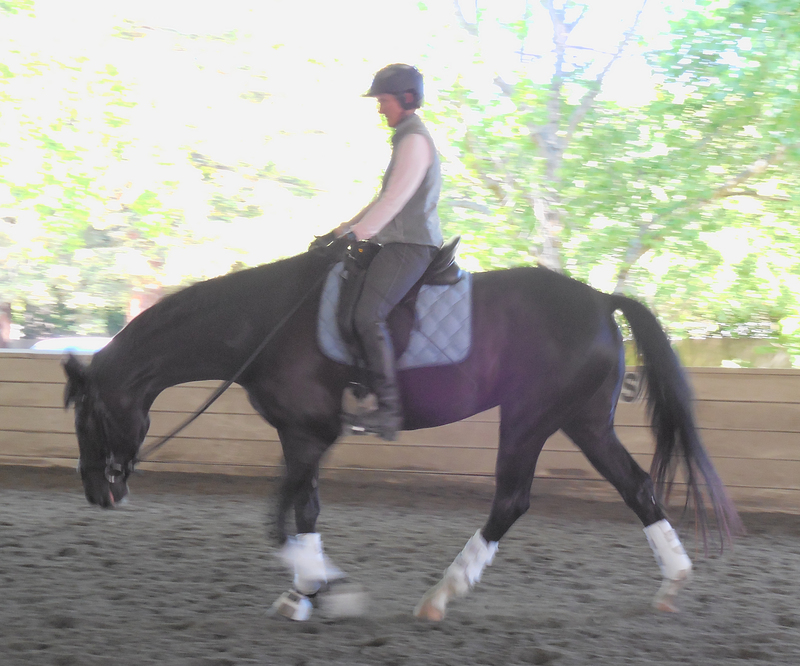 There is much controversy in the dressage world about stretching and, God forbid, allowing the horse to travel with its weight on the forehand. But here is that very combination seen from a different perspective. As this horse stretches, you can see the maximum degree of reach with his hind legs at this particular point in the stride. The fact that his weight is on the forehand actually frees up the hindquarters to stretch and reach in this way, which limbers tight sinew and joints and tones the muscle, preparing them to accept their own body weight, without strain, in collected work later on. I have often said that stretching a horse is like you or I bending over to touch our toes (or however far down we can reach). If you try it, you will feel all the parts of your body that aren’t so limber. 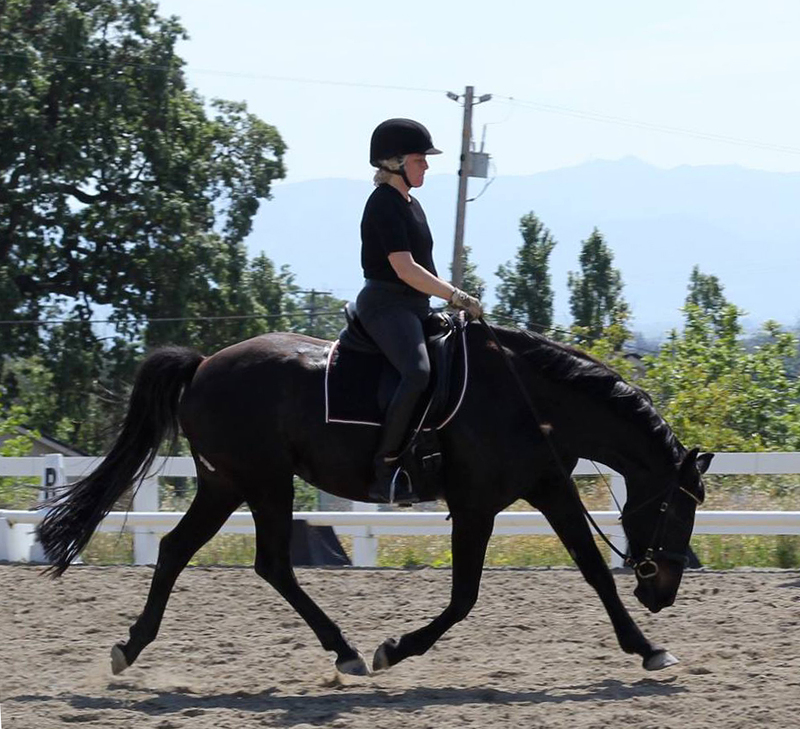 We don’t walk around that way during our waking hours in the same way we don’t normally ride our horses in this position, but that doesn’t mean there isn’t benefit to doing the exercise. In addition, we would not expect a ballet dancer, a gymnast, an Olympic swimmer, or any person engaged in serious athletic endeavor to begin their work-out without warming up with some form of (often rigorous) stretching. Why would we expect our horses to do so? I don’t agree with everything in the article. For example, it doesn’t address the horse’s inherent (not necessarily conscious) ability to work out their own kinks, knots, braces, and tensions if we could only see that, trust it, and get out of their way. This means that the manner in which they stretch changes accordingly and can’t always be put into a box called “the right kind of stretch” or “the wrong kind of stretch.” There is nothing quite like experiencing all types of mental and physical tension dissipate from the horse when they are allowed the freedom to stretch. But it’s good to see general sentiments in favor of stretching balancing out the current alarm about the exercise. Below are two interesting contrasts in the different ways that horses can stretch — each for a different reason. 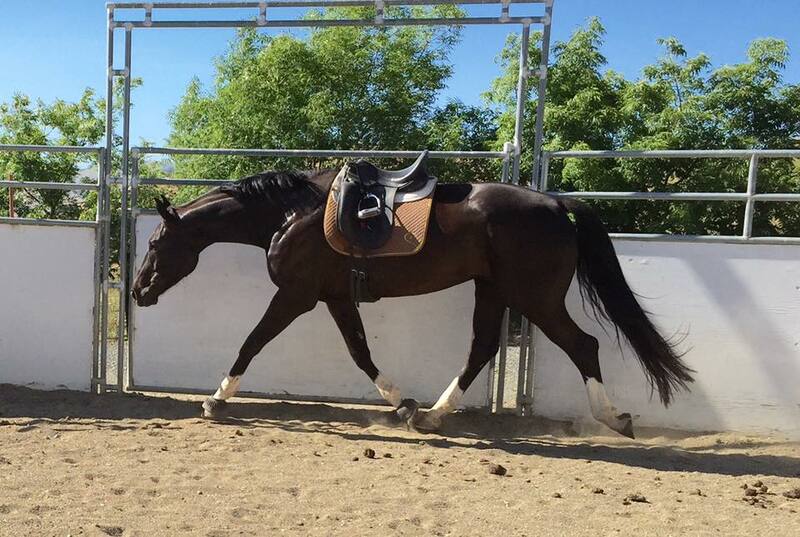 The first photo is of a five-year-old Hanoverian recently started under saddle. There’s lots of reach and mobility in his stride even though he’s out behind himself a bit (hind legs extending out past his rear). But for his age, level of schooling and maturity/immaturity, it’s the kind of stretch appropriate to him right now. It is helping him find his own maximum reach in the trot stride and thus use himself to his full potential.